1.2. Each person entering any one of more of the Competitions (entrants/you/your) and/or accepting a prize in terms of the Competitions agrees and accepts that the Competition rules as set out in these terms and conditions as well as the terms and conditions for the Win a Home Grand Prize Competition are binding on him/her. 3.1.5. you must not be barred or disqualified by any authority from taking delivery and transfer of the Prize/s or any portion thereof. 4.1. Complete and submit the entry form for the relevant Competition you wish to enter within the Competition Period for that Competition, which entry forms will be found on the Private Property website at https://www.privateproperty.co.za/propertytv/winahome/competition. 4.2. Each successful and valid entry for each Competition received up until Sunday, 2 December 2018 will also count as an entry for the Win a Home Grand Prize Competition. The terms and conditions for the Win a Home Grand Prize Competition is available at https://www.privateproperty.co.za/propertytv/winahome/terms-and-conditions. 4.3. There are no further forms to fill in and once you meet the requirements set out in clause 3 above and this clause 4, you will automatically be entered into the Competition. 4.4. You may only submit one entry per calendar day (between 00h00 to 23h59 on any given date) for each Competition herein. 4.5. All entries over and above your first entry for every calendar day during each Competition Period will not be included in the draw for the winner of the Competition or be included for the draw for the finalists for the Win a Home Grand Prize Competition and will not count as a vote for purposes of the Win a Home Designer Challenge. 4.6. For the avoidance of any doubt, in the event where one Competition commences on the same date on which another Competition closes, you may enter once for each Competition on that day. 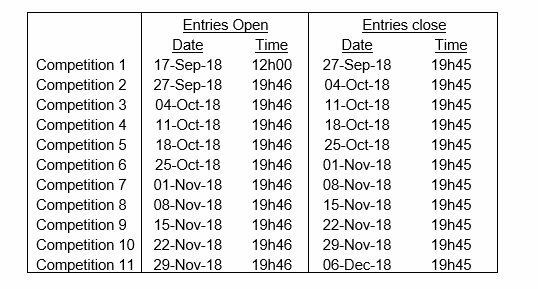 By way of example, on 27 September 2018, you may submit an entry for Competition 1 between 00h00 and 19h45 and you may thereafter also submit an entry for Competition 2 between 19h46 and 23h59. 4.7. You are required to attend to the cost for your entry, including standard internet costs. 4.8. No automated entries will be allowed and each entry must be made by a natural person manually. 5.1. We will randomly draw 1 (one) entry per Competition (Winner) by means of an automated system from all valid entries received for each Competition within 10 (ten) minutes from the closing time of each Competition. 5.2. We will phone the Winner within 30 (thirty) minutes from the closing time for that Competition. 5.3. If a Winner is not immediately contactable within 30 (thirty) minutes from the draw of for that Competition, that Contestant will be disqualified and shall have no claim against us. We will only make 1 (one) attempt to contact each Winner. In the event of a disqualification as contemplated herein, we shall have the right to select a different entrant on the same conditions. 5.4. The Winner will be required to take our telephone call and to participate during the live broadcast of the SABC 3’s, Win a Home television show within 45 (forty-five) minutes from the closing time for that Competition, failing which the Winner will be disqualified and we will have the right to draw a new winner on the same conditions. 5.5. The organisers, the Sponsors, their agents and the SABC will not be held responsible for any disputes arising from the Competitions, determination of the Winners or prize awards. 6.1. For each Competition, three different prizes will be placed/allocated behind three doors positioned in the Win a Home show studio respectively. The Winner of each Competition will be required to select one of the three doors and will receive the prize placed/allocated behind the door he/she selected (Behind the Door Prize), subject to these terms and conditions. 6.2. After selecting the door referred to in 6.1 above, the Winner will be requested to answer a Samsung product-related question (Samsung Question) live on the Win a Home show. If the Winner answers the Samsung Question correctly, he/she will be awarded a Samsung prize (Samsung Prize) as promoted for that Competition. 6.3.1. Capitec shall transfer the Capitec Prize into the Winner’s Capitec account within 10 (ten) business days from determination of the Winner, provided that the Winner does not have any account with Capitec for which monthly repayments are in arrears at the time from determination of the Winner until the time when the Capitec Prize is awarded. 6.3.2. Should the Winner have an account with Capitec for which any one or more monthly repayments are in arrears at the time when Capitec attempts to transfer the Capitec Prize, that Winner will forfeit the Capitec Prize and shall have no claim against us and/or Capitec. For purposes of this Competition, any reference to “Capitec Client”, whether referred to in these terms and conditions, on the Win a Home show and/or on any other promotional material related to the Competition, will mean any person who has an active Global one facility (Capitec Savings Account and/or a Capitec Credit Card and/or Capitec Personal and/or a Capitec credit Facility and/or Capitec funeral plan) in his or her own name at the time when participating on the Win a Home show for the Competition. 6.4. The Winner has to immediately select one of the three doors for the Behind-the-Door Prize and/or answer the Samsung Question and/or answer the Capitec Question live on the show, failing which we may declare the Behind-the-Door Prize and/or Samsung Prize and/or Capitec Prize forfeited. 6.5. We will determine in our sole and unfettered discretion whether the answers to the Samsung Question and/or Capitec Question are correct or not and we will not enter into any debate in this regard. You hereby agree, that should you be selected as a Winner herein, you will accept our decision regarding whether an answer to the Samsung Question and/or Capitec Question is correct or not, and not dispute same. 6.6. The Behind the Door Prize, Samsung Prize and/or Capitec Prize (collectively Prizes), or any parts thereof, may not be exchanged for cash any other item. The Prizes are not transferable. We reserve the right to substitute the Prizes, or part thereof, with any other prize/s of a similar commercial value. 6.7. In addition to the terms and conditions detailed herein, Prizes may further be subject to additional standard terms and conditions specifically related to the items included in the Prizes. 6.8. The Prizes will be limited to the details provided in the prize description for each Competition and Prizes may differ from images used on marketing material for the Competition. 6.9. Prizes will be delivered to the Winners within 30 (thirty) business days from determination of the Winners, unless otherwise stated herein or from time to time on promotional material related to the Competitions. 6.10.2. you will use the Prizes awarded to you, or any part thereof, at own risk. The organizer, the Sponsors, their agents and the SABC shall not be liable for any loss (including, without limitation, indirect or consequential loss), damage, personal injury or death which is suffered or sustained (including but not limited to that arising from any person's negligence) by any person in connection with the acceptance or use the Prizes. 6.11. We/Sponsors shall have no obligation whatsoever to, inter alia, service, maintain, or repair the any Prizes after the delivery thereof. Furthermore, you agree that we/the Sponsors does not have any obligation to replace any Prizes (in part or in full) after the delivery thereof, as a result of, inter alia, malfunction, defect, breakage, wear and tear, misappropriation, misuse or for any other cause or reason whatsoever. 7.1. The Winners will be requested to provide copies of their identification documents and/or valid SABC TV licenses and/or such other documentation we may deem necessary in our sole discretion to confirm that the Winner is eligible to receive the Prizes herein. Winners shall be required to provide electronic copies of their identification documents and valid SABC TV licenses within 48 (forty-eight) hours from being requested to do so by the organisers, failing which the Winner will forfeit the Prize and shall have no claim against us. 7.2. Where relevant, if a Winner does not accept the Prizes as required herein, if an entry is not valid for whatever reason, if a Winner has breached these terms and conditions, if a Winner renounces the Prizes or if we deem such Winner to have renounced the Prizes, we reserve the right to declare the Prizes forfeited. 7.3. Should you be determined as a Winner, you irrevocably agree not to use any language via the telephone call during the live broadcast on Win a Home, which is obscene, offensive or inappropriate. Should a Winner make any comment, or remark via the telephone call during the live broadcast on Win a Home, which we in our sole and unfettered discretion deem as obscene, offensive or inappropriate, we reserve the right to immediately end the call, disqualify the Winner/declare a Prize forfeited and/or choose a new Winner. 7.4. Each Winner may be requested to permit his/her image in marketing material and/or to participate in marketing activities. No compensation will be payable for such use. The Winner has the right to decline such invitation. and we are unable to immediately re-establish contact with that Winner after making one attempt to phone that Winner back. We further reserve the right to end any call and declare a Prize forfeited if we are in our sole discretion unable to properly communicate with a Winner due to a bad connection. The Winner shall have no claim against us as a result of such a forfeiture. In the event of a forfeiture as contemplated herein, we reserve the right to take another caller and announce a new Winner. 7.6. Telephone calls will made during the live broadcast of the Win a Home show on SABC 3. You hereby expressly consent to your voice being recorded and featured on the Win a Home Show should you be selected as a Winner. 7.7. The organiser, Sponsors, their agents and the SABC accept no responsibility for any technical problems with respect to entries. The organiser, Sponsors, their agents and the SABC are not liable for any costs incurred, responses received or any other consequences of user error. 7.8. If any entry was made in a manner which in the organiser's discretion may provide an entrant with an unfair advantage over other entrants, unless these rules specifically allow such conduct, such entrant will be disqualified from the Competition. 7.9. The organiser, the Sponsors, the SABC and their agents shall not be liable for any claim of whatsoever nature as a result of any damage, loss or the like suffered or sustained by an entrant or Winner due to any disqualification or forfeiture of any or all of the Prizes as provided in accordance with this terms and conditions. 7.10. The organisers reserve the right to modify or amend the terms and conditions as well as to terminate any of the Competitions at any time if it is deemed necessary in its sole and unfettered opinion. In the event of such termination, all entrants agree to waive any rights that they may have in terms of the Competition and acknowledge that they will have no recourse against the organizers, the SABC, the Sponsors, their agents and/or suppliers. 7.11. The organisers’ decision regarding any matter concerning the Competition and/or arising out of these terms and conditions, including the determination of the Winners, is final and no correspondence will be entered into. The organisers, the Sponsors, the SABC or their agents will not be held responsible for any disputes arising from the Competition or Prizes awarded herein. 7.12. Nothing in these terms and conditions is intended to, or must be understood to, unlawfully restrict, limit or avoid any rights or obligations, as the case may be, created for either you or us in terms of the Consumer Protection Act, 68 of 2008 (CPA). 7.13. All entrants to this Competition participate entirely at their own risk. By entering the Competition, you consent to these risks and hereby indemnify and hold harmless the organisers, the Sponsors and all their associated entities, their suppliers and the SABC, their directors, employees and agents of any and all liability pertaining to any damage, cost, injuries and losses of whatever nature sustained as a result of their participation in the Competition or use of the Prize, save where such damage, cost, injuries and losses are sustained as a result of the gross negligence or willful misconduct of any indemnified party. 7.14. We will need to process your personal information to validate your entry, to contact you for marketing purposes, as well as to contact you, if you are a Winner, to make necessary arrangements for delivery of the Prize. By entering this Competition, you specifically and expressly consent to us and the Sponsors processing your personal information for these purposes and sending you marketing information/newsletters.